The Golden Hofner is for collectors the ultimate Hofner. 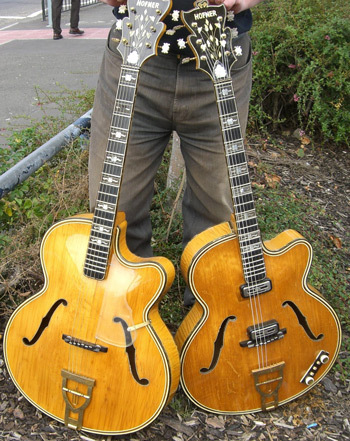 Glamorous and rare, the values of Goldens on the vintage guitar market have rapidly increased over the last twenty years. So what is so special about these Hofners? 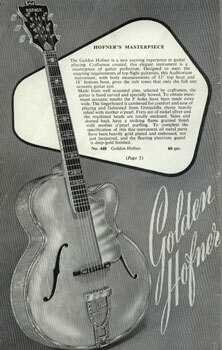 The Golden Hofner was in the Selmer catalogues between 1959 and 1962, although shipping doesn't seem to have commenced until 1960 and continued for a year or two after 1962. Less than one hundred were produced, of which approximately seventy were a mixture of acoustic and electric standard body guitars, and up to twenty five or so were electric Thinline bodies. The Golden was only supplied to the UK market, and was distributed by the Selmer London company. Only a blonde finish was available of course, and all metalwork was gold plated. 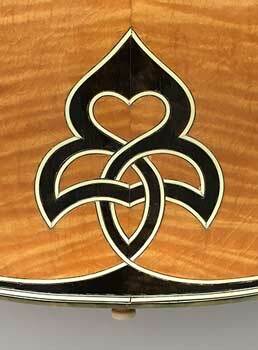 The guitars were a cocktail of exotic timbers, mother of pearl inlays, pearloid and veneer binding and purfling. 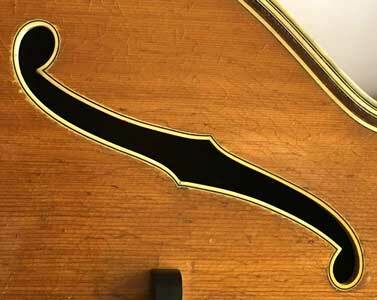 The body size is the largest of any Hofner, with the lower bout measuring 18" across. 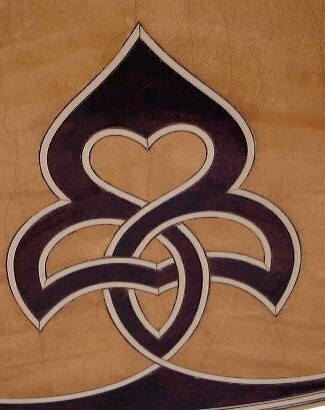 Flame maple was used for the back and sides of the body, with the top usually (but not always!) being carved from solid spruce. The finger board was made from Grenadilla ebony, and this was seated upon an eleven piece (yes, 11 piece!) laminated neck. Although at first glance, the Golden looks similar to the Committee, the Committees at that time only had a 17.5" wide body, and its back and sides are almost always birdseye maple. Of course, the Committee doesn't boast gold plating, the eleven piece neck, and the massive amount of purfling of the Golden either! All electric Goldens had two pickups, the type of which was dependent on when each particular guitar was assembled. The earliest Goldens had the Type 1 "Black Bar" single coil pickup", and the later ones had the single coil "Diamond Logo" single coil or twin coil "Super" Type 511 units. The majority however were fitted with Type 2 "Toaster" pickups. The Hofner rectangular control consul was fitted in all cases. 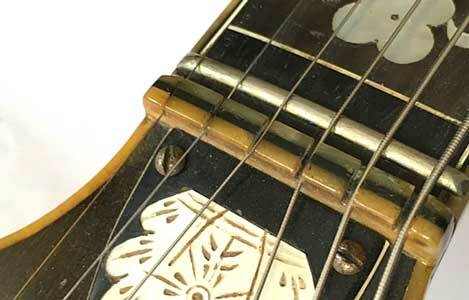 Production of the Golden was commenced in late 1959, but despite this early date, all Goldens have truss rods fitted. 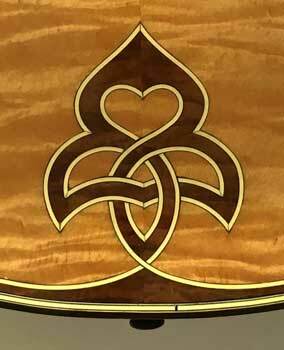 The "Escutcheon" type tailpiece is ornately engraved and gold plated of course. (At the time of Golden Hofner production, the Committee was fitted with the "Lyre" tailpiece, though in about 1963/64, this was changed to a chrome "Escutcheon" type.) The machine heads of the Golden were a top quality enclosed type throughout the whole production period. Finely detailed buttons were fitted, but these tend to be not quite as fragile as those fitted to the Committee which do have a tendency for the extremities of the button to break off. 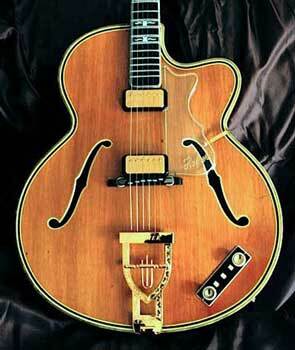 When Hofner introduced the new Golden Hofner in late 1959, this archtop guitar was the successor to the Committee Deluxe in the UK. Even though the two blonde guitars seem to be quite similar, they still differ in some aspects. The body of the Golden Hofner was 18 inches wide, wheras the body of the Committee Deluxe (and the Hofner 470) was only 17.5 wide. The laminated neck made of 11 pieces was still there, but the Golden Hofner (and the 470, too) had been fitted with an adjustable trussrod. 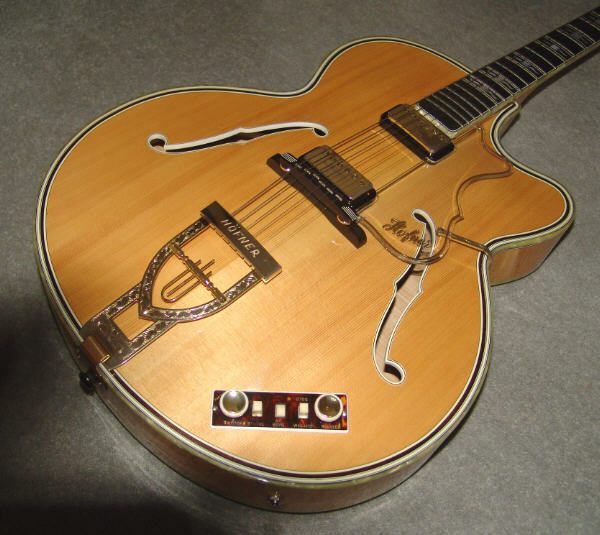 The look of Hofner's most expensive guitars changed considerably at the end of 1959 because the guys at the Bubenreuth factory decided to move away from the white pearloid binding used before on the Committee Deluxe and the 470. The Golden Hofner and the Hofner 470 were now fitted with a new elegant pearloid brown binding. The Golden Hofner kept this beautiful feature not very long, though. 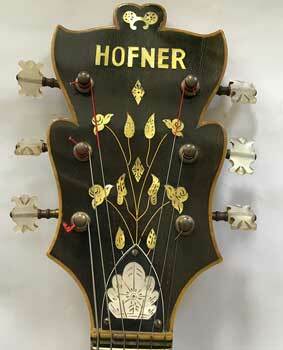 The production of the Golden Hofner had started in November 1959. The Golden Hofner #23 was assembled on 26 January 1960, so it is likely that the bodies of the first 24 examples were all completed by the end of January 1960. According to former CEO Christian Benker, Hofner usually used to work on twelve guitar bodies in a batch. Golden Hofner #25 was assembled in May 1960. This marks a start of the second version of the Golden Hofner. After the 3 month break in production, the look of the guitar had changed in so many details that it seems reasonable to call it a new series. 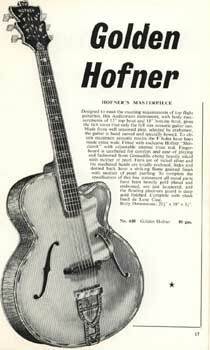 We don‘t know why Hofner decided to do this, but in many ways it seems that they were returning more or less to the design of the Committee Deluxe, maybe following the request of their UK distributor Selmer. The Hofner 470 remained unchanged, keeping the brown binding until production ended in the 1990s. The headstock of Golden Hofner #23 features a distinguished white line edge purfling. A detail which is typical for the Golden Hofner Series 1 built from November 1959 to January 1960. 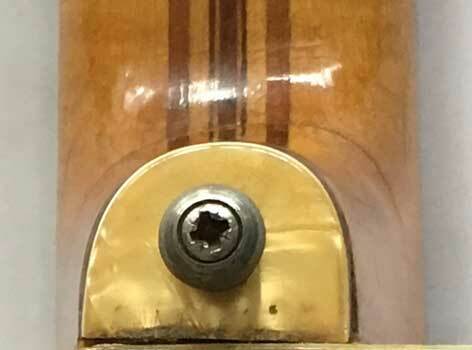 On Golden Hofner #25, the white line on the headstock is missing. 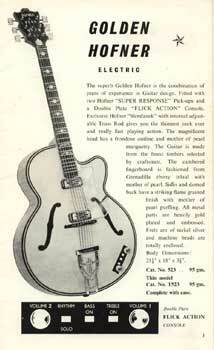 Hofner did not use this feature on any known Golden built from May 1960 until production ended. The brown binding is only to be found on Golden Hofners which were produced before May 1960. 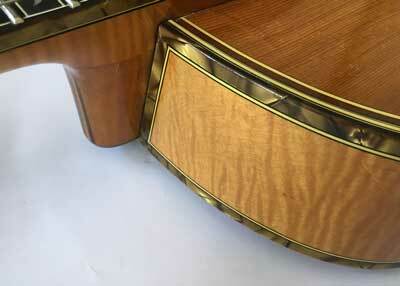 No Golden Thinline with this sort of binding is known, so it seems likely that the production on the Golden Thinline finally started with the introduction of the second series of Golden in spring 1960. All Golden Hofners had white perloid binding by then. 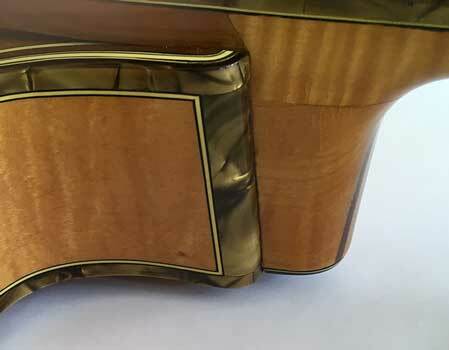 All first series Golden Hofner guitars were fitted with brown binding. 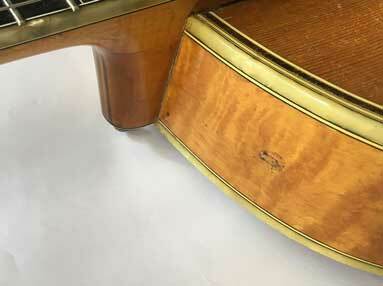 And while many examples of Mk1 had this very elegant looking binding/purfling on both sides of the neck/body joint, Hofner did not equip Series 2 with a similar feature. 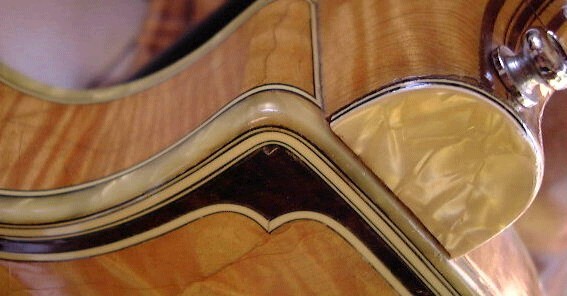 Hofner used brown pearloid for the soundhole binding of Series 1. The second series of the Golden shows white pearloid binding around the soundhole. 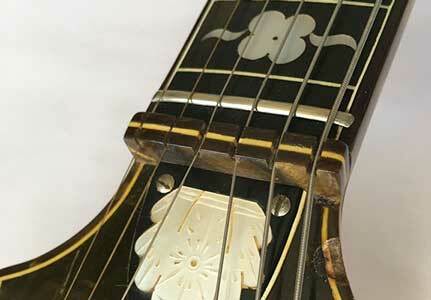 The nut on Golden Hofner Series 1 is brown/white/brown. This sort of nut was used on the Hofner 470 from 1960 through the 1970s.The nut on Series 2 is white/black/white (below). This nut was also used on the Hofner Committee. The heel caps installed on the first series guitars like Golden Hofner #23 were made of the same brown pearloid material used for the striking binding of this guitar. 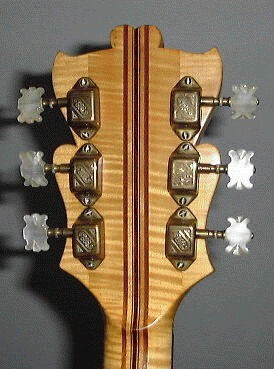 The heel caps of the second series examples like Golden Hofner #25 were made of white pearloid. The majority of Series 1 Goldens have a strip of brown purfling on one or both sides of the body rim directly adjacent to the neck heel. This feature was not continued with the Series 2 guitars. The brown staining used between the body line-purfling on the first series tends to be much lighter/brighter than that used on Series 2. 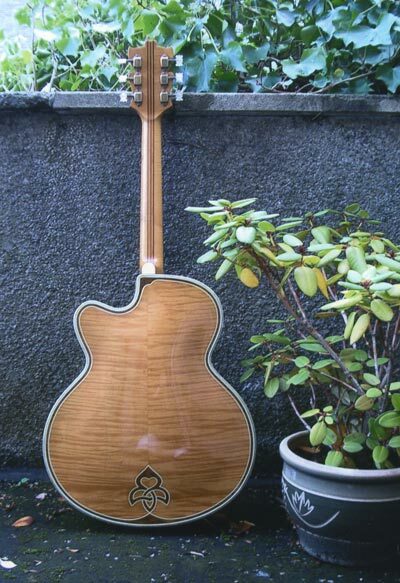 Here you can see the back of a Golden Thinline, assembled in October 1960. 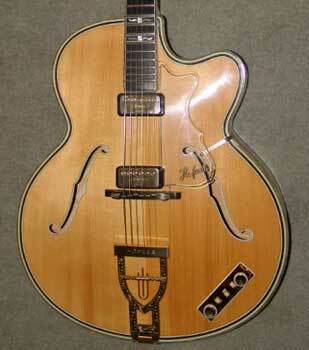 The Acoustic, Electric, and Thinline Golden Hofner is first featured in the 1959/60 Selmer catalogue. Both illustrations show guitars fitted with an opaque pickguard. It is mentioned on the description of the acoustic guitar that "the floating plectrum guard is deep-gold finished. 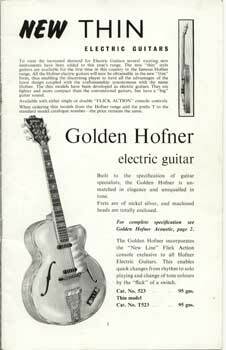 On page 3 of the 1960/61 Selmer catalogue, there is again an advert for the Golden Hofner Electric, including the Thinline version. The picture shows a Golden Mk1 with a clear pickguard. On page 17, we find the advert for the acoustic version of the Golden Hofner. 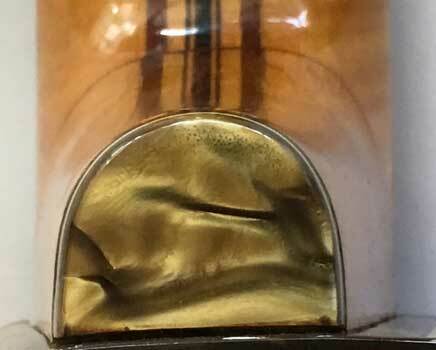 The photo shows a Golden Mk2, again with a clear pickguard. However, it is mentioned on this page that "the floating plectrum guard is deep gold finished“. From the above, it can be assumed that the first batches of Goldens were certainly intended to have the gold pickguard fitted, but a conscious decision had been made, by the time in mid-1960 when the 1960/61 catalogue had been published, to use a clear pickguard. Pictures of Golden #23 supplied by the original owner show that this particular guitar was delivered with a clear pickguard. Earlier numbered Golden Hofner guitars came with the golden pickguard. This would appear to tie in with the catalogue illustrations. The last of the Series 2 Goldens were fitted with the same type of pickguard that was introduced on the Committee model in 1962; i.e. the one with the gold Hofner logo and edge lining embossed on the clear perspex. These guitars were all finished in the same style of the Series 2 full-bodied Goldens. Presumably they were made after the first initial batch of full-bodied guitars. 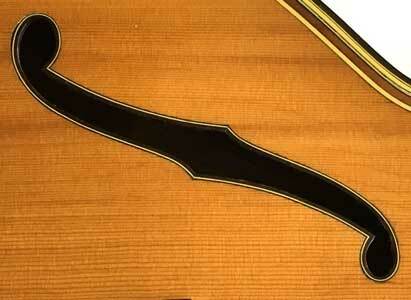 The shape of the body of the Golden Thinline is different to the Golden. Even though both guitars feature an 18 inch body, the shape of cutaway on the Thinline is less rounded and much more flat. Why this should be so has not been established. Golden Hofners Nos 6 & 7. The last time they met must have been back in 1960 at the Hofner Bubenreuth workshops! 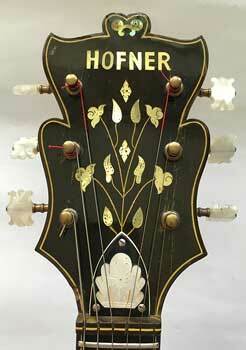 The fore-runner to the Golden was the Hofner Committee Deluxe, which is now an even rarer guitar than the Golden! I believe that this was produced around 1958-59. 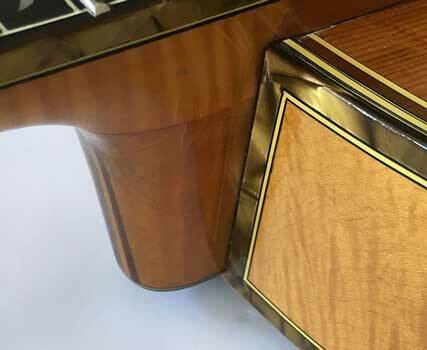 The 11-piece neck and the additional purfling on the rear of the guitar are all very similar to the Golden, although the Deluxe does seem to have wider purfling on the bodytop. The only real differences between the Deluxe and the Golden is that the body width is 17.5" on the Deluxe and 18" on the Golden. The Deluxe does not of course have a truss rod, being produced pre-1960. My guess is that Hofner started off the serial numbers for the Deluxe at 100. The highest number that I have found so far is in the 140's. If my guess is correct, that would make the Deluxe a very rare and desirable guitar ! 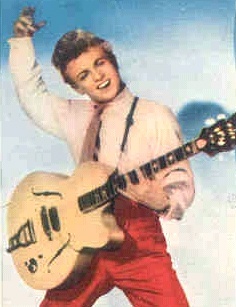 There is a mystery guitar that is associated with the British Rock-n-Roll star of the 1950's, Tommy Steele. Tommy was often pictured with what at first glance appears to be a Hofner Committee, but with an Escutcheon type tailpiece, and....a single black bar pickup in the bridge position which is almost certainly factory fitted. I can only assume that this guitar is a Deluxe with E1 type electrics. If anyone has further information about the guitar, I should be grateful if they would make contact with me..